Front view o cartilages o larynx, trachea an bronchi. A wricht main bronchus, an aa kent as a main or primar bronchus, is an airwey in the respiratory tract that conducts air intae the buffs. 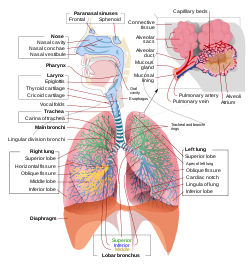 Thare is a richt bronchus an a left bronchus an these bronchi branch intae smawer seicontar an tertiary bronchi which branch intae smawer tubes, kent as bronchioles. Na gas exchynge taks place in the bronchi. This page wis last eeditit on 22 Mairch 2017, at 00:30.